Pictured below is a Helical Gear Motor. A Helical Gear Motor has the teeth cut at an angle to the center line of the gear. This kind of gear is useful because there is no chance of intermittent tooth-to-tooth operation since there are at least two teeth engaged at any time. 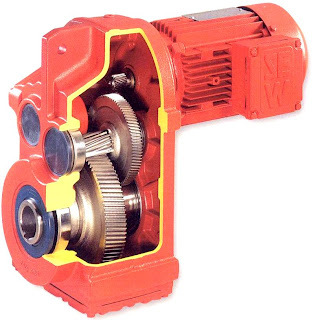 Also helical gears tend to operate quieter than straight cut gears. Among other places, this type of motor is used in Trolley and Bridge Drives. For more crane terms click here.